The Els Club was the first completed venue within a multi billion dollar development at Dubai’s Sports City that now includes the world’s first purpose-built Manchester United Soccer School facility, the ICC's own Global Cricket Academy, the first ever World Hockey Academy and a David Lloyd Tennis Academy. They've certainly not stinted here at Dubai Sports City. Laid out in two returning loops of nine holes within the exclusive “golf course villa community” of Victory Heights, this 18-hole championship course has been designed for golfers of every handicap, with a choice of four tees at every hole. A fair amount of sand was shifted when forming this “desert links,” adding definition to a relatively flat landscape that now features sizeable water hazards at holes 7 and 15. "The Els Club combines the best of all the great clubs that I have played worldwide. The golf challenge is second to none. I am really proud of what we have achieved here. Whether you are an 18 handicap or a scratch golfer, it will be a great test of golf. This course is something very special. I think you can make a course challenging for the best players in the world but at the same time enjoyable for the rest of the world's golfers. We've done that here." Ernie Els 2008. 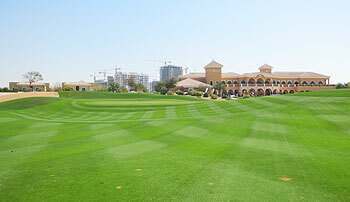 Dubai Sports City is also the base for the first Butch Harmon School of Golf outside the United States. Run by son of legendary golf coach Butch Harmon, Claude Harmon III has coached the 2008 US Masters Champion, Trevor Immelman and other tour pros including Darren Clarke and Adam Scott. The facility houses a state-of-the-art performance institute which includes physical screening and three dimensional video analysis for the students. If you’ve failed to conquer Ernie’s course due to a hook or slice, head over to the Golf School for a tune-up. Sitting on the terrace of the most sumptuous clubhouse I have ever seen, eating a first-rate breakfast while gazing over the pristine practice putting green, I felt instantly as if I had stumbled into a king's paradise where my every whim would be taken care of before I had even thought of it. And the magic of the place was that I felt like I belonged there - a millionaire if only for a day!That the golfing experience didn't quite live up to the billing is not entirely surprising, but I left the Els feeling that there is an opportunity missed here.The course itself is stunning, but only if you can ignore the half-finished building site that surrounds it or some of the less than beautiful skyscrapers that abound in Sports City. The group of 4 buildings decorated by a cricket bat, tennis racquet, golf club and hockey stick stay in my mind as some of the ugliest architecture I have seen anywhere in the world. The fact that on several holes you take your line off the bright red hockey stick is a real blot on the overall experience.Having got that gripe out of the way, the quality of the course is visually stunning and in great condition. The wasteland desert areas give a real sense of where you are, while the manicured fairways and greens are so lush that it feels a real privilege to play off them. And throughout it is a serious test of golf.The highlights were the 7th and 15th holes running either side of the two lakes in the middle of the course, and the 9th and 18th holes playing up towards the magnificent clubhouse.It was good to see some normal length par 3 holes, testing all types of approach shot, rather than the 200+ yarders that seem to be the norm at the other courses around here.The fairways are enormously wide at times and nearly all of the trouble seems to be around the greens, which are fast and very slopey, with a lot of very deep bunkers placed aggressively around most of them.And when you find a green that appears on the card to have no bunkering, like 6th or 8th, then beware, because the wasteland is near at hand at the bottom of some huge slopes to cause you real problems if you miss the green.If I were to be hyper-critical I would say that the course feels a little bit unbalanced as a result - too easy off the tee and too difficult around the green. An example of the difficulty of the slopes is the par 3 second, where it is hard to find a flat spot to place the pin, and some putts break by 10 feet or more. The bunkers also have very deep sand in them, so it is not unusual to get terrible plugged lies - a bit unnecessary when you consider the difficulty of the greens being played to!A final annoyance was that in December, when no other courses had any restrictions, the greenstaff stuck rigidly to a carts on paths policy. With the very wide fairways this became so annoying that we ditched the buggies after 12 holes and carried for the rest of the round.So the Els, for all of its polish, is for me a bit too much style and not enough substance. It still ranks very high compared to most courses that I will ever get to play, but it flatters to deceive and is not as good as some of the other options around here, nor as good as the sumptuous clubhouse surroundings would have you believe. I have to slightly disagree with the previous reviewer as both my playing partner and I had a very enjoyable experience at the Els Club. Met by friendly bag drop staff and a great clubhouse team our day got off to a great start. Playing off the blue tees the course is not repetitive and the holes in my opinion are varied not as much as the truly great courses out here the Majlis or the Earth Course but still a good test of a mid to low handicap golfer. Well bunkered you can tell Ernie is good out of sand as most of the greens are very well protected and the fairway bunkers definitely require some forethought on club choice. The greens are small and accuracy is paramount if you are going to set up a birdie opportunity with only a few straight puts out there. Overall a most enjoyable days golf. 72 hours on from my round at the Els and I'm still unsure what to make of it all. I guess my expectations were raised by reading the previous review and for me it didn't reach the level I was hoping for. There was no car to pick me up, the course staff did not know my name and there was no engraved bag tag presented on the 18th, infact there was no bag tag given at all. Whilst this is a review of the golf course I suppose it is these little extra things that make the whole experience different from the normal round at your local course.As for the course itself, in a lot of places it is very well designed and in general the condition is very good. The greens however were far too soft, my playing partner hit a utility in from about 200 yards and the ball stopped in its own divot. In general though I thought a lot of the holes were too similar, the ones that play around the water obviously stand out in the memory but I would struggle to remember more that 3 of the others.The main clubhouse is finished but not yet open and whilst the temporary one is ok, it is just ok and really nothing more than a glorified portakabin. In this part of the world and at these prices your clubhouse needs to be more than ok and very much more than a portakabin.Would I rush to play it again? Probably not if I'm honest. Rating wise it's somewhere between a 4 and a 5 ball. It's not a bad course and the staff are efficient and polite but I just think that the whole set up is not as good as it should or could be. As I arrived, it turned out that everyone from bag drop, the Course Butler who escorted us to the first tee down to the cart guy could address me by name - I still don't know how they do this - on a busy day they must have over 140 golfers on site. They are currently operating out of a temporary club house (which would put many other permanent club houses to shame) it was perfectly adequate, airconditional, usual high standard of changing rooms, stocked pro shop etc., but in November 2009 the new 60,000 sq ft Mediterranean style permanent clubhouse will be ready. I can quite imagine sitting on the terrace with an ice cold beer watching people coming in to the 9th and 18th greens with the sun setting behind them. The Els Club is a key component of Dubai Sports City which looks like a bit of a building site at the moment, but Victory Heights the residential development that surrounds it is nearing completion and families are starting to move in this month. This is the way of things in Dubai, they'll build the golf courses, then carry on building the houses, hotels, malls and infrastructure around it. On the upside, this does mean that after a few years you'll get a nicely maturing golf course with lots of brand new buildings around it. The course is definitely a thinkers course so don't just get your driver out at every tee box, The Big Easy has put a few nuances into the layout to make that a rash call that you'll regret. Having said that - one of my big hitting playing companions did cut the corner on the 5th almost over some houses, taking the tree and all the bunkers out of play - and went on to score well - fortune favours the brave - I can only dream of hitting it that far. But generally there's an emphasis on accuracy rather than distance - the 8th where the desert snakes in almost all the way across the fairway being another good example of this design principle. As is commonplace here in Dubai the 'rough' is sandy waste ground with native desert plants that don't need watering, saving on water and reducing the environmental impact. It has the added benefit of usually being easier to find your ball - unless of courses it's in spiky desert bush! Having this sandy rough defend the green by isolating it from the fairway on the 12th was a nice touch, it will make you consider your club choice carefully for your second shot, no bump and run on this hole. Water - in the form of a large lake - comes into play on the left of the 7th and on most of the right of the 15th a par 4, I skilfully managed to avoid the lake by veering off left in to the sandy rough! Luckily I had a fortunate lie, recovered well, and was rather pleased to score well on the toughest hole on the course. I also rather enjoyed the 9th, a charming par four with a mature tree in the middle at the end of the first loop back to the clubhouse, but the inverted saucer green gave me a swift lessen in humility, thankfully the new clubhouse terrace wasn't yet full of golfers having a beer and watching me four putt. Did I mention the greens were quick? A few weeks before I arrived the whole area had a massive spike in temperature and all of the grass suffered, all the clubs I played that week seemed to have recovered OK from this and I thought the Els Club course was in pretty good condition all things considered - not perfect, but very acceptable for the time of year, this being their low season when they do their maintenance - they were starting to plant more flora to increase the overall level of greenery and claimed to be spending $1.5m USD on planting - this being Dubai where nothing is done by halves - I can believe it! Extra marks to the Els Club cart guy who came round with ice cold towels and cold water at every other hole, he was a very welcome sight as I was playing in August in 41 degree heat. On the 18th hole I was presented with a personally engraved metal name tag with the Els Club logo on for my golf bag, a nice touch which was a perfect souvenir to complete my day. As I had a bit of time on my hands, I was given a brief tour of the renowned Butch Harmon school by one of the other guys I played with that day - they'd helped him lower his handicap from 10 to 4 in six months. Oh, to live in Dubai and go back to school! All in all it's a great course that will only get better with time - the team at The Els Club are a class act who are raising the bar for all the other golf clubs in the UAE in terms of service - I can't wait to return in the cooler weather and walk the course when it's in peak condition. They pull out all the stops to make you feel like a member for a day. Play it if you can.